Like quinoa and other grains, farro is trending on menus—often subbing for rice in traditional applications, such as the Italian rice balls known as arancini. 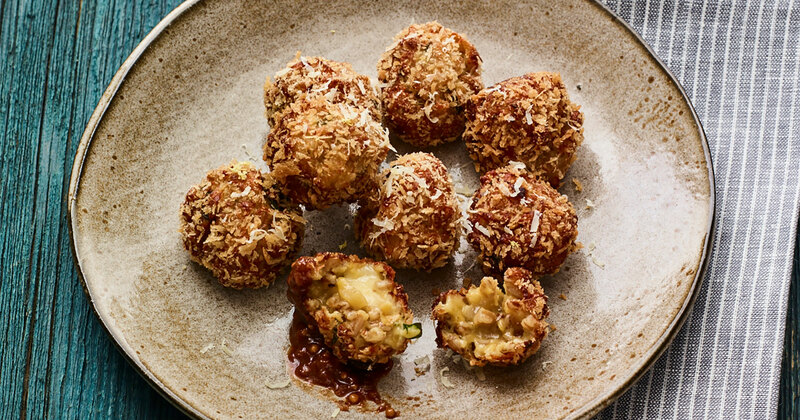 Here, chef Elizabeth Falkner combines cooked farro with Gruyere cheese, onions, grated parsnips, Aleppo chili flakes and several other ingredients, then forms the mixture into balls for frying. The crispy farro-cini are served with housemade cherry mustard. 1. Prepare cherry mustard: In medium saucepan over medium-high heat, combine cherries, vinegar, water and Kirsch; bring to a boil. Reduce heat and simmer 3 to 5 minutes; cool. 2. In food processor, puree cherry mixture with mustard, honey and salt; refrigerate until service. 3. Prepare farro-cini: In large saucepan, heat olive oil. Add onions and parsnips; saute 3 to 4 minutes. Stir in garlic, sherry, butter, thyme and chili; saute 2 to 3 minutes longer. Stir in cooked farro and a little additional water if mixture looks too dry (it should resemble risotto). Season to taste with salt and pepper. Transfer mixture to large bowl to cool. 4. In small bowl, combine 2 tablespoon panko and milk to moisten. Stir in farro mixture, 1 egg, both Gruyere cheeses and parsley. Chill until mixture is cold and firms up. 5. Spread remaining 2 cups bread crumbs on waxed paper. In small, deep bowl, whisk remaining egg with pinch of salt. Remove farro mixture from refrigerator. Using a 1½-inch scoop, form farro mixture into balls. Dip balls into egg and roll in bread crumbs, coating surface. 6. Meanwhile, heat canola oil in deep fat fryer. Fry farro balls in small batches in hot oil until golden brown and hot throughout. Drain on paper towels. 7. To serve, sprinkle finely grated Gruyere over farro-cini. Serve immediately, with cherry mustard.